Amazon Kindle e-reader, 7th Generation, Black, with touchscreen. Model No. WP63GW. In full working order, screen in perfect condition, it charges fine and one charge lasts for ages. This model doesn't have the back light. I don't have the original box unfortunately - it comes with a USB/charging cable. Has been a very faithful book reader, but it's now surplus to requirements. Thank you. 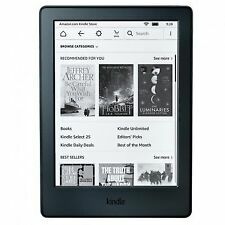 BRAND NEW - Amazon Kindle 4GB 6" Wi-Fi E-reader - Black. Condition is New. Dispatched with Royal Mail Signed For® 2nd Class. New listingAMAZON KINDLE 7TH GEN WIFI WP63GW BLACK TOUCHSCREEN 4GB NEW CONDITION. AMAZON KINDLE 7TH GEN WIFI WP63GW BLACK TOUCHSCREEN 4GB. Near new condition. 4.5 out of 5 stars - AMAZON KINDLE 7TH GEN WIFI WP63GW BLACK TOUCHSCREEN 4GB NEW CONDITION. 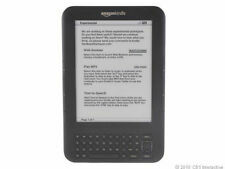 73 product ratings73 product ratings - AMAZON KINDLE 7TH GEN WIFI WP63GW BLACK TOUCHSCREEN 4GB NEW CONDITION. Amazon Kindle 4GB, Wi-Fi, 6in - Black. Condition is New. Dispatched with Royal Mail 1st Class. 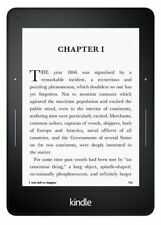 Black Kindle E Reader. Great condition. 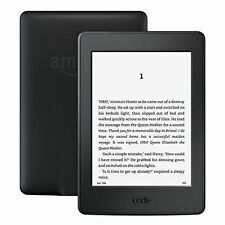 7th generation Kindle E-Reader, used with box. Slight scuff marks on the front (pictured). Small dot mark on the screen but it doesn't effect the reading ability (also pictured). O nly ever set up and then tried, no longer needed. F ully working. Kindle has been inspected, tested, updated where applicable and reset to factory default. Certified Amazon Kindle 7th Gen Paperwhite E-reader 6" HD Display 300ppi Black! We have tested this item and can confirm that it is in full working order. The device has signs of wear and tear. Reset and works and is ready for the new owner. Used kindle in good condition. May have general signs of wear and tear. Screen will be in good condition with no marks that affect your experience. Device is reset and is ready for the new owner. The kindle is in good physical condition. Works as it should. Screen is fine. Now Kindle is 11% thinner and 16% lighter than the previous-generation Kindle, making it easy and comfortable to hold in one hand. Design is thinner and lighter than the previous-generation Kindle, and available in your choice of black or white. Amazon Kindle 4GB 6" Wi-Fi E-reader - Black 7th Generation. Unwanted gift. Condition is Used. Fully functioning Amazon Kindle. Has two/three small scuff, not very noticable. Has been reset, also much cheaper than most second-hand Kindle 8th generation, 4GB. THE SCREEN IS ONLY SHOWING THE BATTERY IS AT 0%. Amazon Kindle Fire 7th Gen 8gb Wi-fi - Black. Condition is Used. Dispatched with Royal Mail 1st Class. Excellent condition only been used a handful of times can't find the box charger not included. Now Kindle is 11% thinner and 16% lighter than the previous-generation Kindle, making it easy and comfortable to hold in one hand. Amazon Kindle 7th Generation. The blacks and whites on the screen are uniform, improving image quality. AMAZON KINDLE 7TH GENERATION 4GB. It's in used condition there is scratch mark all around the case and screen. screen got visible scratch and mark. 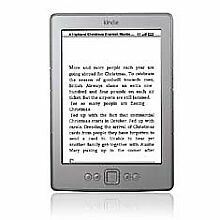 The Amazon Kindle Kindle is a useful device driven by a robust 1 GHz processor and running on Fire OS platform. The product is available in Black. For an amazing Price this lightweight Kindle is perfect for reading books without the fuss of carrying them all around with you! Easy on your eyes--touchscreen display that reads like real paper, no screen glare, even in bright sunlight! Amazon Kindle 7th Generation 4GB 6" Wi-Fi E-reader - Black. Condition is Used. some scratches around outter rim of kindle otherwise screen is Unscratched and in good condition Dispatched with Royal Mail 1st Class. Amazon Kindle 4GB 6" Wi-Fi E-reader - Black Model WP63GW Black Official Case. - OFFICIAL AMAZON KINDLE CASE. SEND BY SECOND CLASS RECORDED. MODEL: WP63GW. Amazon Kindle TOUCH 7th Gen 4GB, Wi-Fi, 6in. NO OTHER ACCESSORIES - JUST THE KINDLE AS IN THE PICTURES. AMAZON KINDLE WP63GW EREADER. 4GB STORAGE. Is a lost property item. See photos. Price reduced to reflect. Amazon Kindle Fire 7th Gen 8gb Wi-fi - Black. Dispatched with Royal Mail 1st Class. Amazon Kindle. 4th Generation Black. Item location: Budapest, Hungary. For parts only. AMAZON KINDLE 7TH GEN WIFI WP63GW BLACK TOUCHSCREEN 4GB NEW CONDITION. AMAZON KINDLE WP63GW EREADER. 4GB STORAGE. HARD CASE INCLUDED.